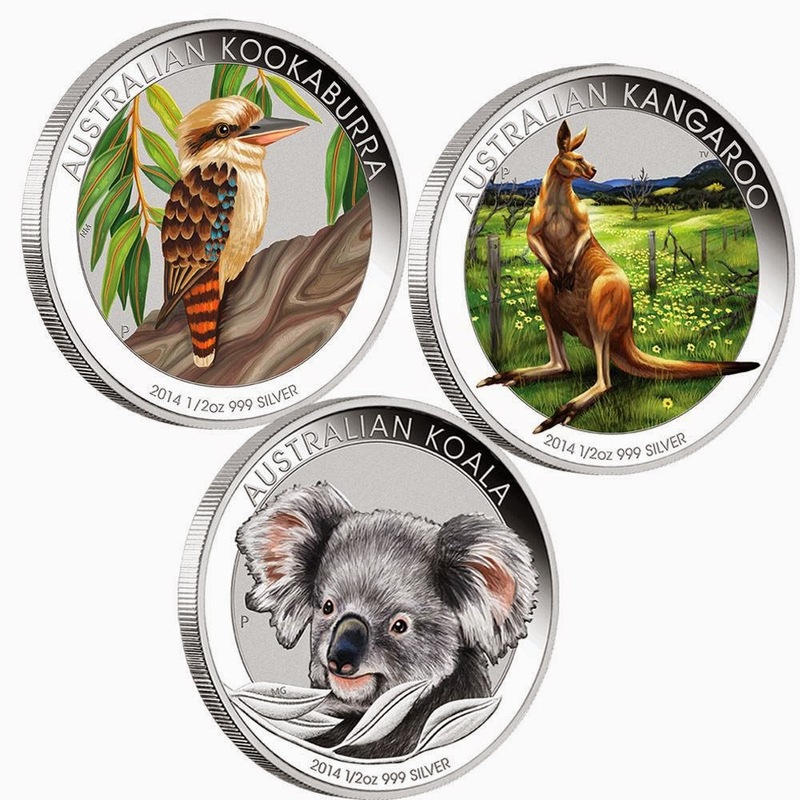 These stunning coloured coins celebrate the kangaroo, koala and kookaburra – three of Australia’s most iconic and loved bush creatures. Each coin is struck from 1/2oz of 99.9% pure silver. The reverse of the kangaroo coin portrays a vivid image of a kangaroo amid a rural scene of everlasting wildflowers framed by hills and trees. The design includes the inscription AUSTRALIAN KANGAROO, The Perth Mint’s ‘P’ mintmark, and the 2014 year-date. The koala coin’s reverse depicts a close-up coloured portrait of a koala with a spray of eucalyptus leaves. The design includes the inscription AUSTRALIAN KOALA, The Perth Mint’s ‘P’ mintmark, and the 2014 year-date. The reverse of the kookaburra coin features a vibrant image of a young kookaburra perched on a tree branch sheltered by leaves. The design includes the inscription AUSTRALIAN KOOKABURRA, The Perth Mint’s ‘P’ mintmark, and the 2014 year-date. Each coin is issued as legal tender under the Australian Currency Act 1965, and features the Ian Rank-Broadley effigy of Her Majesty Queen Elizabeth II and the monetary denomination on the obverse. The Perth Mint will issue no more than 4,000 of the Australian Outback 2014 1/2oz Silver Coloured Coin Collection in this packaging, from a maximum mintage of 5,000 coins. The collection is individually housed in a prestigious grey display case and custom designed shipper, and accompanied by a numbered Certificate of Authenticity.